Unlike other social media platforms, Instagram seems to be tailor-made for artists. 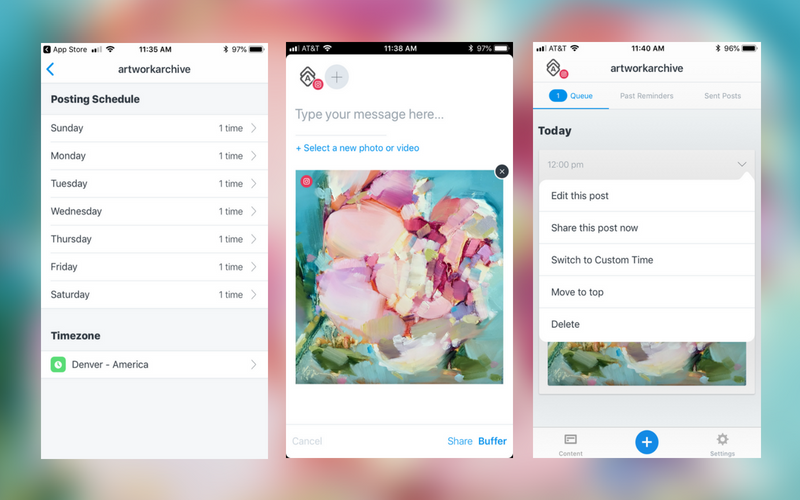 From its visual nature and ease of use—not to mention all those art collector users—this app could easily become your new favorite way to share your art and creative spirit. And, posting a picture here and there is a good start. 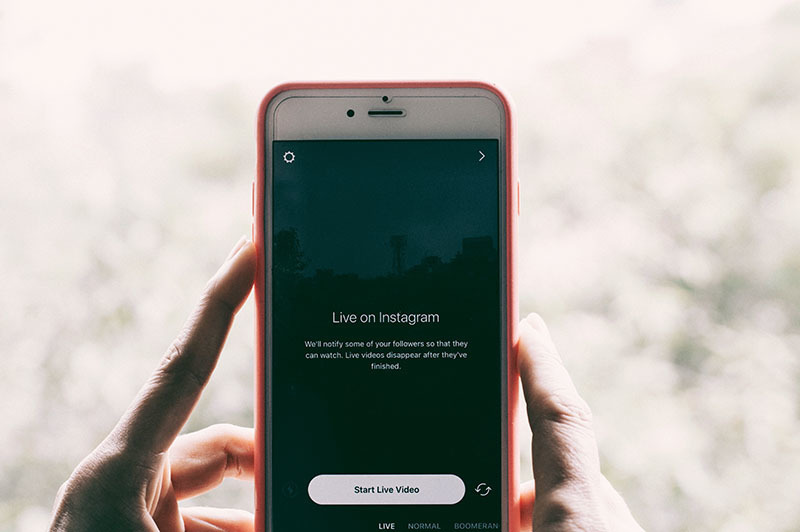 But if you really want to reap the benefits, you need to step up your Instagram game and learn how to market your art in the best way possible. The good news? There are SO MANY apps these days to help get your art business Instagram-ready, from the pictures to the execution. Check out four of our favorite apps you should be using to market your art on Instagram. An example of Gretchen Warsen’s work “After Party” on the Repost for Instagram app. When someone else posts about your art business and accomplishments on Instagram, don’t let the love fest end there. Just like when someone shares about you on Facebook, you are going to want to reshare the post with your own followers. It provides social proof that you’re doing awesome things and are being recognized for it! Which can be a HUGE help in convincing collectors who happen across your art account to buy your work. Unfortunately, Instagram doesn’t have its own sharing feature. But there’s a trick that Insta-savvy artists use, and it’s called the Repost for Instagram app. Instagram will automatically open, and you’ll have the option to post to your Story or your Feed. TIP: If it’s a small shout-out, a 24-hour post to your Story might work best. But if it’s juicy content that you want people to see forever as they scroll through your feed, choose Feed. Then, you’ll go through the motions of posting as usual! Select the post from your phone’s camera roll, add a filter if necessary. Finally, if you’re posting to your feed, hold your finger down on the caption area until the “Paste” option pops up. Clicking paste will copy the caption from the original post into your new post, so everyone can read the props you received. Write an intro if you need to provide a little context to your followers or express your gratitude—and voilà! Your followers will be impressed, and the original Instagrammer will appreciate the share as well. Catch the eye of collectors, designers, consultants, etc. by helping them envision your work in the larger context. Because while your work is stunning on its own, it can turn an ordinary room into a work of art, too! Illustrate exactly how your art makes a room complete with an app that previews your art right on the wall. 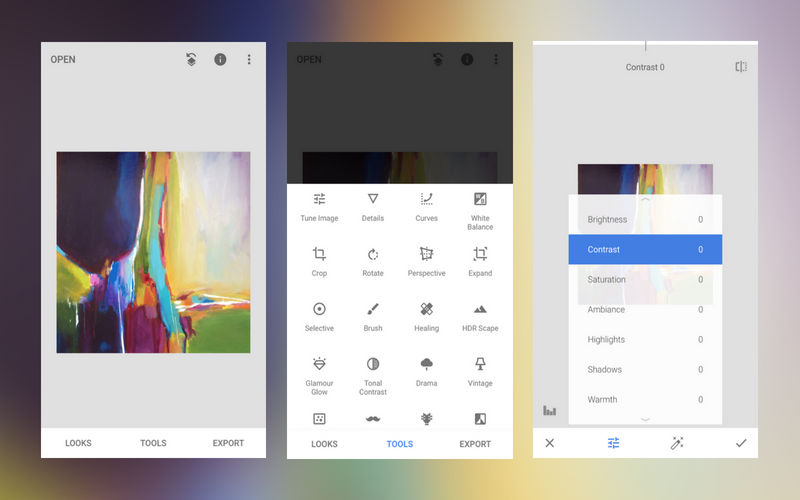 There are a bunch of art mockup apps out there, but we love how quick and easy it is to use is WallApp. While it’s surprisingly not a mobile app, simply go to the website and choose from the many stock room photos they provide. TIP: You can upload your own staged room pictures as well, or grab them from a royalty-free site like Unsplash, Pixabay, or Stocksnap. Click the “Drag Your Artwork Here” box to upload images of your work from your computer and there you have it! Once you’ve uploaded a piece, you can scroll through the different rooms to see what you like best. Or, to start from scratch, just click “Reset Artwork” or “Reset Room” at the bottom. Be warned, there is a tiny “Made with the OhMyPrints Wall Art Tool” watermark at the bottom of the image, which you can always choose to crop out later with a photo-editing tool. 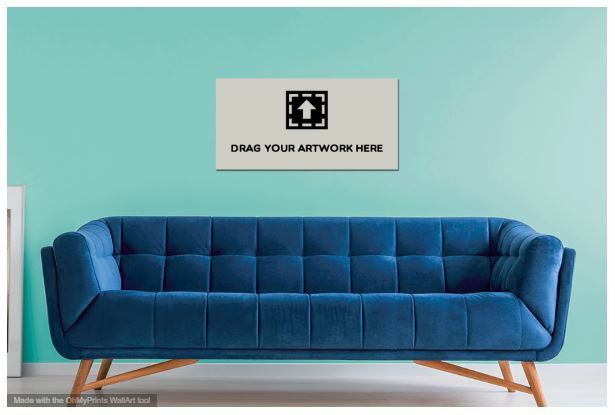 PhotoFunia is another quick site with options to preview your work in frames or on gallery walls. Or, test out a free trial of iArtView if you’re looking for more high-quality, customizable images. Mix in these staged images with detail shots, works-in-progress, studio life, and more fun ideas to pique the interest of curious collectors on Instagram. An example of Erica Dornbusch’s work “Resting in the Abstract” being edited in Snapseed. Ever snap a photo of your art for Instagram and it looks nothing like real life? You’re not alone. It’s a common problem we see on artists’ accounts all the time. But, the “it is what it is” mentality should never be used as an excuse to post bad pictures. If the colors and lighting don’t show the true quality of your artwork, your artist brand is going to take a hit. Either potential buyers are going to be turned off from your Instagram feed altogether, or they’ll be annoyed that the piece they thought they were buying doesn’t match what they got in the mail. Sales will be lost and you’ll spend more time getting your art business back on track than it would have taken to edit your photos. We say it all the time to our artists, but images are everything! And, there are a bunch of editing apps available these days to get your art looking as true-to-life as possible. For instance, the Snapseed app gives you just the right amount of professional editing tools to perfect your photos. The best part? It’s easy to use, and free for iOS and Android users. Open the app and tap anywhere on the screen to download the photo of your art from your camera roll. For all your editing options, click “Tools” at the bottom. Tune Image - adjust the brightness, contrast, shadows, color saturation, etc. Crop - cut out any background or edge you don’t want showing with your art, rotate an image, change the image orientation to portrait or landscape, etc. Perspective - shift the plane of the image, good for those mockups where the wall or frame isn’t straight on. And, that’s just the beginning! This YouTube video goes more in depth about how to use each feature, but even the basics will help your photos look better in no time. TIP: Be careful not to over edit. Remember, the goal is to make the picture of your piece match as closely as possible to the real deal. An example of Kathleen Broaderick’s work “Otro Peony” on Buffer. We get it! No artist wants to spend all their time on social media when they could be in the studio. But, Instagram can be a pretty lucrative avenue for artists if they know how to leverage it. And when it comes to gaining followers, it’s crucial to find out the best times to post so you can get even more engagement. But these days, you don’t have to sit around and wait for the clock to strike posting time. Work smarter and save yourself some time by using a scheduling tool for Instagram. Instagram didn’t always allow scheduling, but now that it does, artists should hop on board A.S.A.P. There are a few great options, too, but let’s talk about what we use at Artwork Archive—Buffer. First, make sure your Instagram account is set up as a business account, not personal. Learn how to switch here. Install the Buffer app on your phone, or set up an account through their website. Next, follow the directions to link your Buffer app to your Instagram account. Here comes the fun part! In Settings, you’ll be able to create your posting schedule to include the days of the week and times you want to post. TIP: On your Instagram profile, click the icon of 4 vertical lines in the top right-hand corner of the screen to see your business insights. Choose “Audience” and scroll down to see the hours and days that your followers are most active. This will help you understand when to schedule your posts! When you’re ready to go, just compose your post in the Buffer dashboard online or in the mobile app. (You can also type it out and copy and paste it into Buffer.) Click “Add to Queue” and it will automatically save to the next time slot available in your schedule. You can even drag and drop to rearrange posts, switch to a different time slot, or edit to a unique time outside of the normal posting schedule. You can only schedule images with square dimensions. You can set and receive reminders for manually posting images with other dimensions, but as of right now, that’s what Buffer allows. Another thing, you can tag a location in your post on Buffer, but not other users in the image. Once the picture is posted, open Instagram, click the three dots at the top and hit “Edit.” You’ll be able to tag an Instagram user as usual from here. Scheduling works for more than just Instagram! Save time on Twitter, Facebook, even LinkedIn, so you can get back to the studio faster. Just remember that scheduling tools can’t cut out social media altogether. You have to be social to see the full benefits! 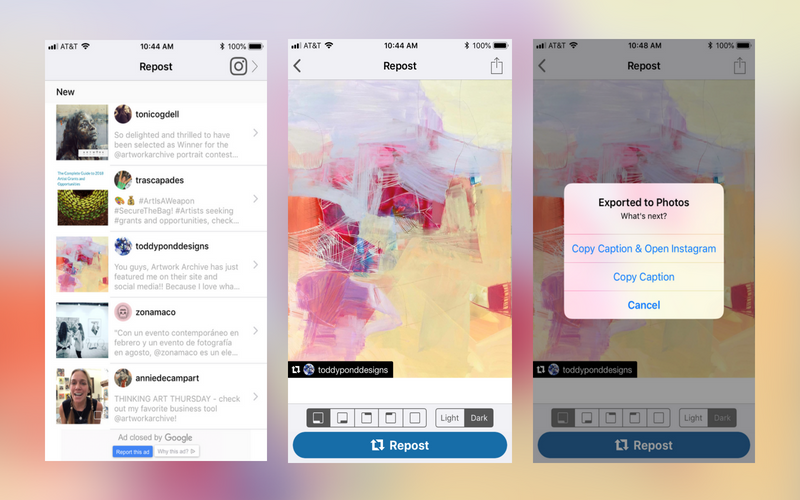 Using these apps to help market your art will help you turn Instagram into something more profitable for your art business. Because the more people like what they see on your account, the more interested buyers will be fighting over your art. Then when you start making sales, you can keep everything organized on Artwork Archive. Mark which pieces have been sold, generate invoices to get paid and track sales insights so your Instagram account stays profitable. If you are not already using Artwork Archive, give it a try free with no commitments. Art marketing isn’t just for the extroverts. We show introverts how to shine without changing who they are. Stumped on what to get the artist on your list? Our holiday gift guide has unique and useful finds for all your artistic friends and family. There are many different ways to sell work online. Carolyn Edlund walks us through how to choose the right one for you.